For those of us who’ve been vegan for a long time, it can be tempting to say “going vegan is easy,” suggesting that our passion for animal liberation should override all personal discomfort and that the choice should be obvious for everyone. But truly, transitioning to a plant-based diet is not simple for many, especially for those who don’t have access to wholesome plant-based foods. What does it mean not to have access to plant-based food? 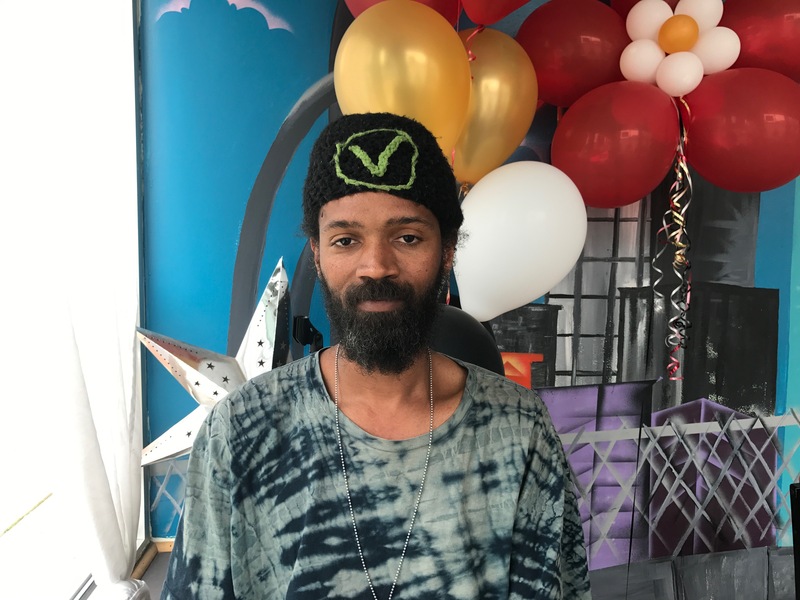 CAA volunteer Jenell Holden is passionate about advocating for a vegan diet, and he’s also passionate about making plant-based food available to people who don’t have access. After growing up in Chicago, Jenell moved to Georgia to live with his grandmother. 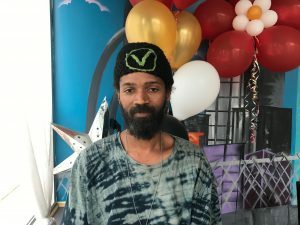 There, he got involved volunteering for Food Not Bombs, a nonprofit that collects unused food from grocery stores, bakeries, and produce markets, and brings it to those in need. Talking with other volunteers in the group, he learned more about plight of animals used for food and transitioned to a vegan diet. About two years ago, he followed his girlfriend up to the the Twin Cities, where he discovered not only our group, Compassionate Action for Animals, but also Sisters’ Camelot. Very similar to Food Not Bombs, Sisters’ Camelot works to promote sustainability, strengthen community, and raise awareness about food justice. They model a way to unconditionally share free, healthy food in our communities. Twice a week, Jenell volunteers with the group, loading their re-purposed city bus with leftover organic produce. They drive around, pick a spot, and try to give away every bit. “I like helping others have access to organic vegetables,” Jenell says. “I hear that veganism is expensive, but so much overpriced produce is thrown away. It takes progressive nonprofits to bridge that gap, getting food from corporations and distributing it. An organic bell pepper can cost three dollars at the grocery store, and we give away cases of them for free. “People are appreciative. They didn’t have any food and had another week to go before getting paycheck. The mom has houseful of kids that eat, and she never can spend enough at a grocery store. If people don’t have a healthy meal, they may not have enough energy to go to work the next day. And so Sister’s Camelot works to make it just as easy to get some fresh veggies. But beyond the vital outreach they do, what are some other ways that communities can help make plant-based food more accessible? Jenell says, “There should be more community potlucks. It lightens the burden of each household having to cook big meal. And there should be more things like Sisters’ Camelot, because they only deliver food twice a week. Also, lower the price of food. It would sell faster, and there would be less waste. I loved seeing that J. Selby’s has a pay-what-you-can bowl. Maybe we could! As we move forward in our strategic planning process, we’ll be considering ways that we can be develop programs to be more effective in fulfilling our mission, which would include making it possible for more people to choose a plant-based diet. For more information about food justice from a vegan perspective, we recommend learning about the work of two additional nonprofits, Food Empowerment Project and A Well-Fed World.